The next issue of On Spec (Vol. 28 No 4, for those of you who are keeping track) is currently at the printer, and we should be sending them out within the next 2 weeks. We’ll have new fiction by Hayden Trenholm, Chelsea Vowel, Susan Forest, Jordan Taylor, Robert Luke Wilkins, Sally McBride and C.J. Lavigne. 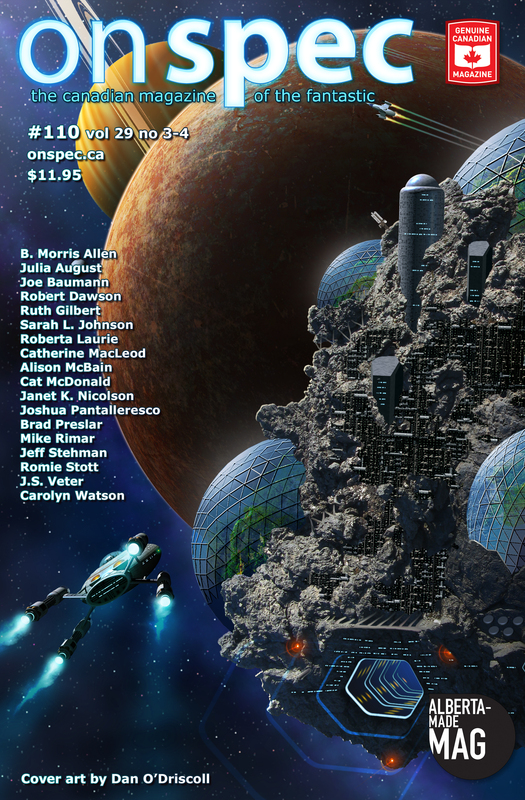 Plus artist and author interviews by our own Roberta Laurie, and Cat McDonald, an editorial by Virginia O’Dine, Can-Con 2017 report by Diane Walton, poetry from Josh Pearce and a beautiful tribute in verse for the late Ursula Le Guin, written by Sarah Tolmie. Hello! My name is Teddy Edwards and I’m helping to produce an exciting new project with On Spec Magazine. It’s called On Spec Sound Ideas. Plainly, it’s a podcast comprised of fully dramatized radio-plays of stories On Spec has published in the past. We have a full cast of actors together, standing around a microphone and reciting lines just like the golden age of radio. On Spec has always had a knack for printing excellent character stories that beg to be brought to other media, and sound play/ radio drama/ theater of the mind would be my first choice. Even if I had the budget for a movie or web series. They find a magical line between immersive and engaging, like reading a movie. Something fairly exciting about this project, (I think,) is that you don’t need to be a subscriber or a Patreon supporter to enjoy it! It is a free piece of On Spec that can be downloaded and enjoyed by anybody. We only ask that if you enjoy it, to share it with someone else you think might enjoy it. The first episode is based on “Space Monkeys”, a story by Ryan M. Williams, and looks to be finished up around mid to late March. This fine story is part of our Teacher Toolkit, and will be freely available for middle and secondary school educators to access and use with their classes. I’m very excited about this, and I hope you are too!